The criteria that commercial landscaping companies use to assess their work and employees comes as second nature to them. When evaluating the company that performs your landscaping and snow removal, you may need some guideposts to ensure your property is being taken care of at the highest standard. Here are some questions to consider when evaluating your current company or comparing grounds maintenance companies in the running for your new hire. How long has the company been in business? Where is the company located? Does the company understand what your property needs are, and do they have the capability to accomplish them year-round? What is the size of the company? Can they provide references? Turfscape is proud to be able to provide references from accounts that they have held for 20 years. Does the company have the correct equipment to complete the job such as a variety of mowers for different sized areas of grass? Is the equipment kept clean and professional looking? Does the crew have a professional image by wearing uniforms to identify themselves? Uniforms are a necessity when working in commercial areas with many cars. The Turfscape team wears neon yellow shirts to provide visibility to those driving in and out of a property. Does the staff partake in continued education such as gaining industry certification or to become a pesticide applicator? Are they willing to participate in any safety training specific to your commercial property? Do they have a stable workforce of seasoned workers on the crew to guide any new employees? Do the employees understand what is expected of them and follow standard operating procedure? How many employees do they have at their peak? 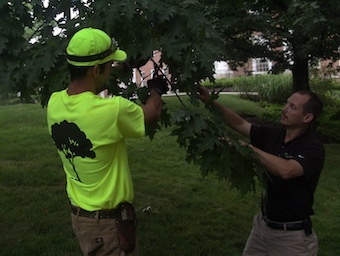 Turfscape has 130 employees, giving it the opportunity to provide the same level of service as a larger company, but small enough to focus on relationships with customers. For many people, a bigger company seems better in their minds, but bigger can also mean more people involved in the communication process. This makes it harder to reach someone about a problem. Turfscape has one Account Manager as the sole contact for each property. Any questions or problems are directed to them and a plan for resolution is reached after only one point of communication. Are the Account Managers following up with you each week to ensure quality is met? When a manager is communicating with you, do they seem to only be aiming to make a sale, or do they genuinely seem to want to make a difference on your property? Do you know when the company will be visiting your property? Do you know what type of work they will be doing? How often does the Account Manager walk the property to recommend aesthetic enhancements, check on safety, or ensure functionality of the landscape design? Turfscape uses a software called Boss LM which allows the contact at each account to see when and what type of work is scheduled and performed on their property. The most important point of these to consider is communication. Any business partnership must focus on the relationship with the manager and their ability to service your needs. Once you have peace of mind that your property is in the right hands, the rest of the evaluative criteria will be met.